Combining print and online marketing materials strengthens a practice and leaves patients more informed. Academic Urology and Urogynecology of Arizona (AUUA) provides both men and women compassionate care for a variety of urologic conditions. Based in Arizona, this practice is active in the latest clinical research, which not only benefits patients with cutting-edge clinical trials, but offers them access to state-of-the-art technology for treatment. When it came to marketing their practice, AUUA turned to Dynamic Digital Advertising (DDA) for their premier services in both custom print marketing and website design and development. DDA has an extensive background in marketing medical practices across the country and around the world. When AUUA needed assistance in strengthening their marketing strategy, DDA offered print production services for a variety of hardcopy marketing materials. 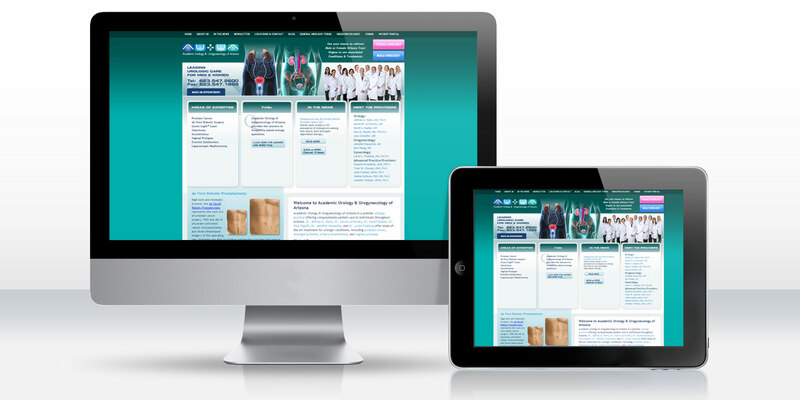 Once a print campaign was launched, AUUA wanted to broaden their reach, so an online presence was needed to help more patients learn about AUUA’s expertise and the clinical research they conduct, while also assisting patients find answers to some of the most common urology-related questions. The first step in promoting AUUA was creating a comprehensive brochure that informed the reader of the practice and its capabilities. DDA also designed a series of eight quarter-page ads for AUUA, each sharing a central design approach. Every ad grabs the viewer’s attention with a commanding statement that is backed with text and appropriate imagery that voices the medical practice's expertise in the areas of urology and urogynecology. When AUUA wanted to announce the arrival of a gynecologist to the surrounding community of referring physicians, DDA provided the design, production, and mail fulfillment of an introductory postcard. The postcard featured a clean, four-color design and complemented Academic Urology and Urogynecology's established visual identity. In addition to the print materials, DDA worked with AUUA to design and develop a custom website to promote and inform the visitor of all AUUA has to offer. Degreed DDA copywriters worked with the AUUA physicians to write over 40 pages of content for the site, all search-engine optimized by DDA. DDA designers carried over aesthetics from the established print materials and incorporated them into the layout of the site. The user-friendly website even includes an online form for patients to request an appointment. Equipped with print and online marketing materials, AUUA is ready and able to inform and attract potential patients about the various urologic conditions they treat and the advanced treatments they use to help patients improve and maintain their quality of life.